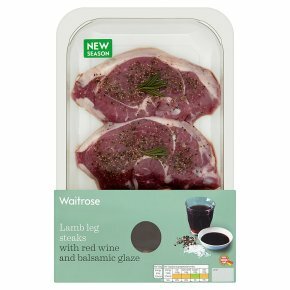 INGREDIENTS: lamb (84%), red wine, red wine vinegar, grape must, salt, rosemary, black pepper, preservatives (potassium metabisulphite, sulphur dioxide). Pan Fry. Time: 10-14 minutes. Preheat a non-stick frying pan. Remove all packaging retaining sachet of sauce. Cook on high and seal each side for 4-6 minutes. Remove steaks from pan and add contents of sachet. Deglaze pan and boil for 1 minute. Return steaks and baste with glaze for 1 minute more.